Smooth, rounded edges, a beautiful piece of the finest Himalayan salt. The natural healing quality of the salt not only creates a conversation piece; it allows you and your guests to indulge your senses. 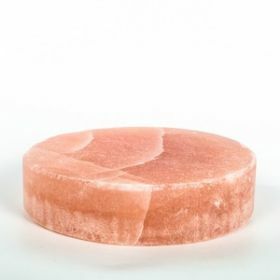 Made from the purest salt of the earth, these carved plates of Himalayan salt bring joy to any kitchen. Place on a stove or grill and allow the flavors to infuse and tantalize your senses… Need a beautiful presentation piece? The pink color draws the eye and creates a visually pleasing meal. These salt plates are a culinary delight.